Can new laws save endangered species? High consumer demand for illicit goods such as ivory and exotic animals has created a $19 billion global illegal wildlife trafficking industry. 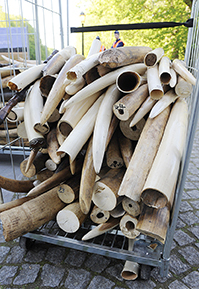 Recently, countries have collaborated to prosecute smugglers and poachers with new bans on imports and sales of smuggled goods. In addition to new protections for rhinos and elephants being hunted for ivory, international groups are working to protect sharks, whales, tigers and tuna from human threats. The European Union’s ban on sales of animal-tested products has led other countries to follow suit, though other measures related to circus animals and bullfighting in European countries remain controversial. In the United States, new questions about extending human rights to high-intelligence animals, including chimpanzees and dolphins, have emerged in the courts. Federal and state authorities also have passed restrictions on animal breeders and owners of exotic pets. Governments have stepped up efforts to combat the illegal wildlife trade that has endangered rhinos, elephants, tigers and hundreds of rare species of turtles and snakes in Africa and Asia. The 28-country European Union (EU) in 2013 banned the marketing of animal-tested products, and countries such as India, Brazil and China have passed similar, less extensive measures. Meanwhile, in the U.K. and Spain, bills related to bullfighting and circus animals have created tension among legislators.